Children come into Korean orphanages for many reasons and at different times in their lives. Some are abandoned; some are abused. Others end up in orphanages because a permanent caretaker is unavailable, unable, or unwilling to take care of them for a variety of reasons, including incarceration, disability, or divorce. Regardless the reason, a child’s arrival at an orphanage marks a new and very different chapter of that child’s life. It is important to make this transition as positive and smooth as possible for both the child and the caretakers. Part of that positive experience is making sure the new child has the clothing and basic necessities needed. At Samsungwon, an orphanage in Gumi, KKOOM has been helping aid this transition for many years from our discretionary funds. 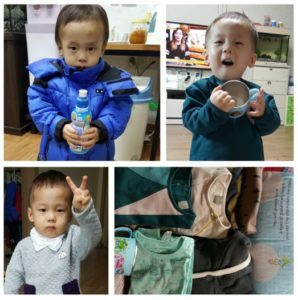 When word came that a new child was admitted to Samsungwon and there was an emergency need, KKOOM would help supply funds for clothing, a new stroller or a baby carrier – whatever was needed. Samsungwon budgets to update the children’s clothing three times a year and to purchase new shoes at least once a year for each child. We do not want it misinterpreted that these children do not have the basic necessities of life. But when a child shows up with virtually nothing in between these planned purchasing times, it can put a stress on Samsungwon’s resources and also stress on the new children. This is where KKOOM has been happy to help in previous years and provide those necessities. Additional funds if the child is an infant and needs additional basic necessities (e.g., stroller) or in KKOOM’s discretion, in consultation with the child’s senior caretaker. As simple as this sounds, we are proud to have the capacity to formalize this program, thanks to our donors’ generous contributions. We are sure that the Welcome Boost Program will be a welcomed asset to the children and caregivers at Samsungwon. Do you want to help? Please consider donating on a monthly basis to keep this program well-funded! *At this time, the Welcome Boost Program is only available at Samsungwon orphanage due to resources and sustainability of the program.